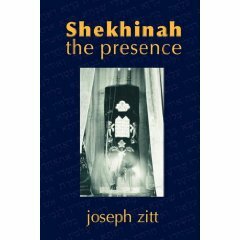 Shekhinah: The Presence is a book-length poem derived from the movements, texts, and structures of Jewish worship. Focusing on the figure of the Shekhinah, the mystic embodiment of the Presence of God, as she appears to the congregants at a morning service, the poem examines the meaning of tradition and the power of prayer. Shekhinah: the Presence began as a dance/performance piece. I composed the movement sketch in late 1989, and began to work with a group of dancers in creating it. While the piece’s roots are deeply Jewish, none of the dancers were Jewish, and they asked me to write a text explaining what the movements mean. I was surprised that the text presented itself not as prose. but as poetry, and grew quite long. I decided to use the text within the piece, which I would read from the side of the performance space. When the text grew far too long to use in performance, I decided to create it as a printed book. I wanted the text to be intelligible to a wide audience, and worked with my editor, Claudia Crowley, to make it as clear as the technical manuals that we wrote in our day jobs. Photographs by Matthew Sharlot of Jewish ritual objects added a visual thread among the chapters. The book was originally published in a limited edition in 1992 by Metatron Press in Austin, Texas. This new edition, published in 2009 by Apocryphile Press in Berkeley, California, recreates the contents of the original edition, and makes it widely available for the first time.